Learn to demonstrate the value of intelligent content and content marketing ROI inside the organization. Content is an expression of everything an organization is and everything an organization does. Stop for a moment and think about this statement. Understanding this definition of content is powerful. That moment when content connects to its audience, when a user engages or a robot processes, adds and redistributes value; and this can be measured as content marketing ROI. All of our stories, knowledge, and data, including content marketing ROI and transaction data gathered in big data farms, are content. This is not just the kind of content that content marketers use to create a customer experience. That’s important too, but this content goes beyond content marketing, regards everything in an organization, and can take many forms—wisdom, cognition, intelligence, knowledge, information, value and data. This is something we need to be conscious of as we make our content assets intelligently. There is a continuum to content that has value and it’s everywhere inside our enterprises. It’s spread across marketing, operations, IT, finance and service delivery. It’s an amalgam that is moving and working with the other business content, most of the time fairly haphazardly and without structure. Content is not just abundant. It’s also valuable everywhere in the enterprise, and present as intellectual property, training and development, knowledge management, operations and legal; and it can be reused again and again. ​Data is the microscopic level of content. Data with context becomes information. Information that is actionable becomes knowledge. 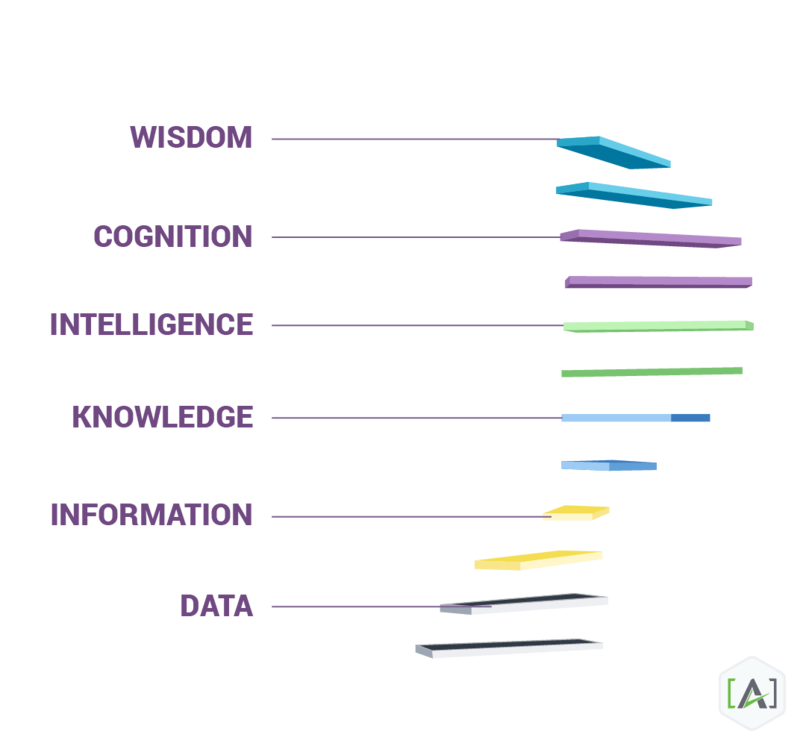 Knowledge that is paired with experience and in relationship with other knowledge becomes intelligence, and intelligence that is mapped against a large field and subjected to pattern recognition and statistical probability becomes cognition. At a cosmological level we have wisdom. Now consider that all content ROI ultimately comes from engagement at some level. User engagement is born of impressions which happen when content gets to a human or a robot. Like humans, robots are also consumers of information, and in some cases consume content at a higher rate. Robots are also responsible for repackaging information and delivering it to humans. It’s an amplifying circle—generating impressions creates engagement, which stimulates robot understanding of content, which then provides answers to humans, creates more impressions and ultimately drives significant value in an enterprise. Content is also valuable to the extent that it influences human awareness, intelligence and behavior. The more interaction, the more likely that content can create influence. Content actually becomes more valuable as a result of human and robot impressions. This is the reason that content needs to be a balance sheet asset and why it’s vital that CFOs and CMOs understand this. Content has the ability to deliver more return than the investment that went into it. That which can be invested in, that delivers an ongoing return, is an asset, and it needs to be valued as such by the business. "Impressions are enabled by structure and driven by content reuse, and content reuse drives ROI and reduces the cost of asset production, delivery and distribution." Intelligent content is not the destination, however; it’s the road to our customers through our distribution channels. Ultimately, we care about customers and their experiences. To reach humans and robots, published content must be intelligent and adaptable to multiple contexts, channels and platforms. How we get there is intelligent content, and content engineering is how we get to intelligent content. Let’s take a moment and look at the many types of distribution channels that exist. First, there are those we own and control — the digital channels under our roof. Then, there’s content we publish via syndicated external channels we don’t own. Finally, there are native mobile apps, embedded systems, email, social and print. Quality content presented across multiple channels drives impressions and behaviors. 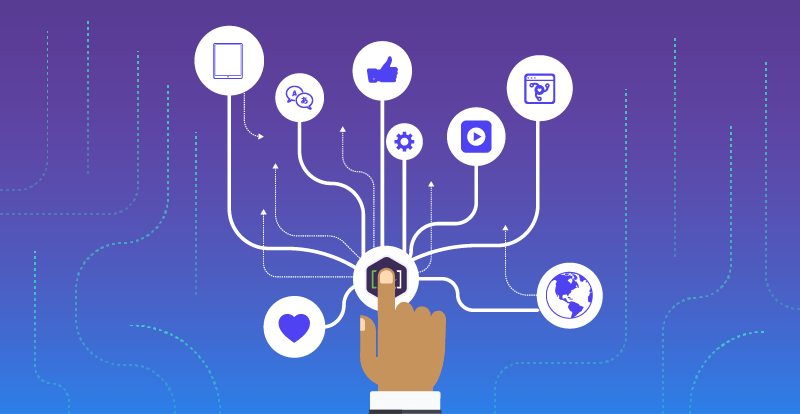 And when humans connect with that content, it builds goodwill and inspires actions, like event sign ups, form fills, shares, likes, comments, downloads and purchases. Measuring these actions equates to content marketing ROI and places value on the content which triggered the user. Great content experiences can also generate return visits, positive referrals, feedback and even donations. Let’s take a look at how we can measure ROI from content reuse. Add the total number of site entrances to any content asset and then multiply by relative cost to buy that entrance via Google AdWords CPC. Start with an original piece of content, one that is attracting new entrances to the site on the basics of keyword targeting. Next, value that new entrance at the same level at which Google would charge to buy that entrance. Finally, add up all the different entrances due to reuse and use a tool (Moz, etc.) to figure out the cost of the sessions. Based on any given period, we can determine how much we would have had to spend to get the same return. For example, if it would normally cost $8,000 to get people to a page using AdWords, and the cost with content reuse is only $1,000, our ROI is 800%. This involves taking quantifiable measures, including traffic, social shares, links and placements, and determining how much each is worth by analyzing existing data. For example, if we’re willing to pay x for a new visitor, x for a social share and x for a link, getting a placement in a major syndicated source also has a significant dollar value. All we need to do is put a number on it and multiply. Start by looking at the initial content asset cost and determining how much value by volume was aggregated by that particular asset. Then choose a past time period and determine the return in value volume for every dollar invested. Conversion attribution can be more difficult to get a handle on, since attribution is easier with user session data gleaned from the CEM platform and even easier still using lead scoring. Over time, sessions that have been converted, although anonymous, can still be identified. With lead scoring we can group content with tags and run analysis against those tags. When a conversion happens, we can determine which content is coming up more often in a given funnel, especially when using multi-session analysis. When did this user reveal himself or herself and become non-anonymous? What were the proceeding steps? Which content assets were associated with that conversion? Using these answers, the highest performing assets can be valued as directly contributing to that conversion. All we need to do is look at sessions and add total dollars in revenue attributed to sessions showing significant content engagement. Tools are emerging that are trying to apply machine intelligence to do this same kind of analysis. One company already in the game is IDIO. 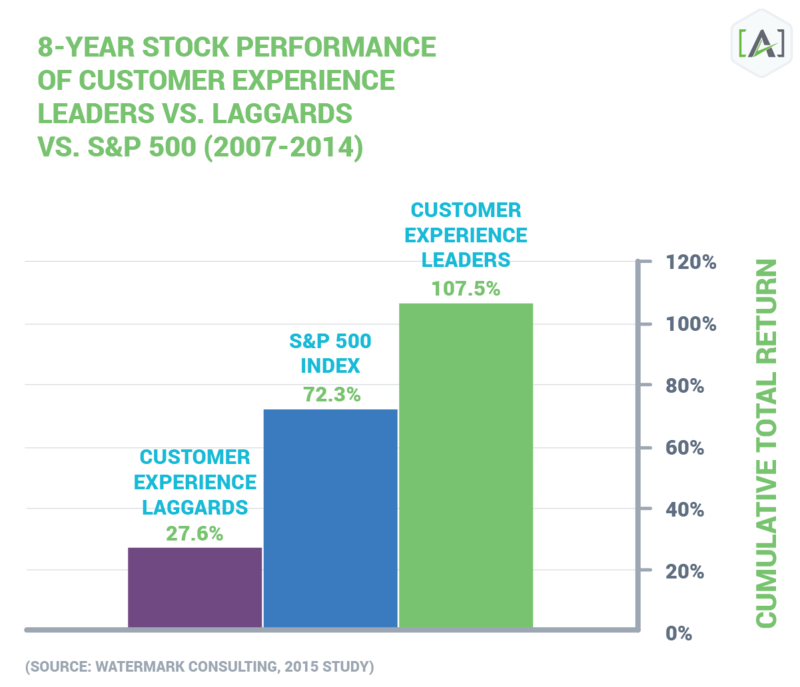 An analysis of the total stock returns for two model portfolios comprised of the top 10 (“Leaders”) and bottom 10 (“Laggards”) publicly traded companies shows how companies investing in content assets and customer experience are measurably more valuable in stock than their peers. Leaders outperformed the broader market, generating a total return that was 35 points higher than the S&P 500 Index. Laggards trailed far behind, posting a total return that was 45 points lower than that of the broader market. The leaders in this study enjoy a better ROI from investing in content and customer experience, including higher revenues due to better retention, less price sensitivity, greater wallet share and positive word-of-mouth and lower expenses due to reduced acquisition costs, fewer complaints, and the less intense service requirements of happy, loyal customers. Goodwill, brand recognition and intellectual property are already on our balance sheets. Why not have content there and actively measure return on assets in the content line item? Helping CEOs understand this crucial value of content opens the doors to competitive advantage and relevance in the cognitive era. Intelligent content, structure and market relevance in the cognitive world are all connected. Connectivity precedes throughput. To earn impressions, content must be available and it must be reused to obtain full ROI. With reuse, our goal is to grow impressions and reduce the cost per impression (CPI). A single content asset has huge potential value. The above models clearly demonstrate that a single content asset has huge potential value for any organization. Content engineering, content modeling and structuring content unlocks that value by enabling exponential reuse, leading to more impressions, better results and increased content marketing ROI. Yet how is reuse accomplished? The answer structured content. Structuring content enables reuse. It allows content to cross platforms, be read by robots, and to scale. This is achieved via a team effort lead by the content strategist and the content engineer. While the content strategist is focused on message, the content engineer (CE) is focused on model. It is the content strategist who plans for the creation, publication, and governance of useful, usable content, while it is the content engineer who organizes the shape, structure, and application of content. True content reuse, customer experience and intelligent content depend on both content strategy and content engineering to succeed. Let’s begin with a look at the content model. Content models enable content reuse by achieving a number of beneficial tasks. It is immediately obvious that they map-content relationships, architect structured content, power personalization, present content types, and facilitate development. 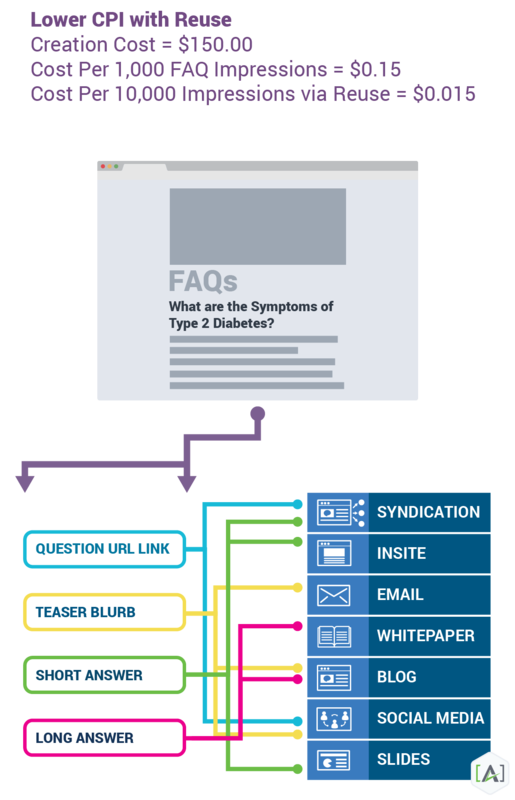 But upon closer look we see they also emerge from user stories, shape the editorial, add intelligence, can align with DITA information models, and reduce integration costs. Content models are always fluid organic moving organisms that frame content for the future. Content has become increasingly integral to the digital economy. Content is driving most of the value in new marketplaces. Content marketing, content interactions and social sharing are taking over corporate marketing and ad spend. All customer-facing enterprises are getting into the digital content publishing business (studies, stats) and publishers are diversifying revenue streams beyond advertising, leveraging content assets in new ways to increase top line revenues. Content is the currency for full-cycle customer experience management, from top funnel to retention and advocacy. Content drives valuations of new media companies, but is not reflected directly in accounting outside of expenses. Media companies value content assets and very few other organizations track the value of content assets, let alone capitalize them. Intangible assets exist throughout corporate balance sheets. Intellectual property, goodwill, and others have an established history as persistent assets. Few corporations capitalize content, and there’s a major blind spot in company valuation as a result. Content performance metrics exist in many forms, from many sources. Content demonstrates characteristics of valuable assets. In digital environments, content interactions are knowable; and, with the right systems, individual ROI can be calculated. No model yet exists for demonstrating that value on a per-asset basis and as an aggregate valuation. A valuation model can and should exist. [A]'s published eBook, "Content Engineering for a Multi-Channel World". [A]'s slide deck, "Engineering Content for Bots, AI and Marketing Automation", with related resource guide. [A]'s experienced content engineers are available to support and extend teams with engineering functions to complement existing strategy, creative, development, and UX professionals. Contact [A] for a free consultation today.